Spinal headaches can result after spinal procedures such as a lumbar puncture or even an epidural.Probably the most common complication of injections that enter the spinal canal is a "wet tap". This occurs when the needle penetrates the spinal sac and enters the spinal fluid. In itself, this is not dangerous. With an epidural, the epidural needle is larger than the spinal needle, therefore, the hole in the spinal sack may continue to leak and not seal itself off immediately. This causes a spinal fluid leak - or wet tap and a very bad headache. The pain occurs because fluid pressure in the skull decreases. This is literally a hypotension state in the brain. That is why the headache goes away when you lie down - the spinal fluid pressure goes back to normal in your skull. Most spinal headaches go away in a few days when the hole in the dura seals itself. 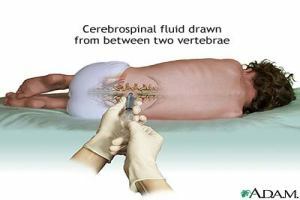 Cerebrospinal fluid is produced by the brain at a rate of 500-700cc every 24 hours. There are small arachnoid villi that function as one way valves. They allow the fluid to drain into the venous system to be reabsorbed within the body. At any one given time, you have between 140-270cc of fluid cushioning the brain and spinal cord. Anything less or more causes severe headaches. It is important to realize that you do not have to have all of the symptoms of spinal headache to be diagnosed with one. Many times, patients will worry about this onset of a new type of headache. Generally speaking, if the symptoms do not resolve with treatment, then an MRI of the brain is warrented. Why not a CT? Because the imaging of an MRI can get a look at the meninges. With low pressure situations, the meninges, or the tissue covering the braine, will look a little thicker and the ventricles in the center of the brain will look narrowed. NOTE: A new onset of a severe headache during labor or immediately post-partum requires imaging as it may be an emergency type of headache. There are ways to speed up the healing of the puncture in the spinal sac. The most common treatment for a spinal headache is a "blood patch". This may be done at the time of the tap or epidural if the doctor sees that he/she may have punctured the dura. If not it may be done several days later if the headache has not gone away. It involves taking a small amount of blood from a vein in your arm, mixing with a small amount of sterile saline, and injecting it into your back in the epidural space. The blood clots and "patches" the hole, giving it more time to complete healing. For treatment of acute pain, we often do infusions of steroid and 300mg of caffeine. This has been shown to cut the severe pain of the headache as it may take up to 24 hours for a blood patch to have its full effect. If you are in the hospital after having delivered a baby, you may also be offered pain medication such as hydrocodone. In this specific case, we do recommend opioid treatment. Irritation of the meninges, for whatever reason, is one of the most excruiciating pain syndromes anyone could suffer from. Complete Blog Roll and RSS feed.